Will Alex Rance and Tom Lynch be teammates in 2019? APPLE carts, big fish, the big tuna. Just as he is when he uniquely attacks every ball that enters the Richmond backline on a weekend, Alex Rance, even when he mixes metaphors, is compelling watching when he's interviewed on TV. He's different, interesting, prepared to go where others won't with his actions on the field and his words off it. 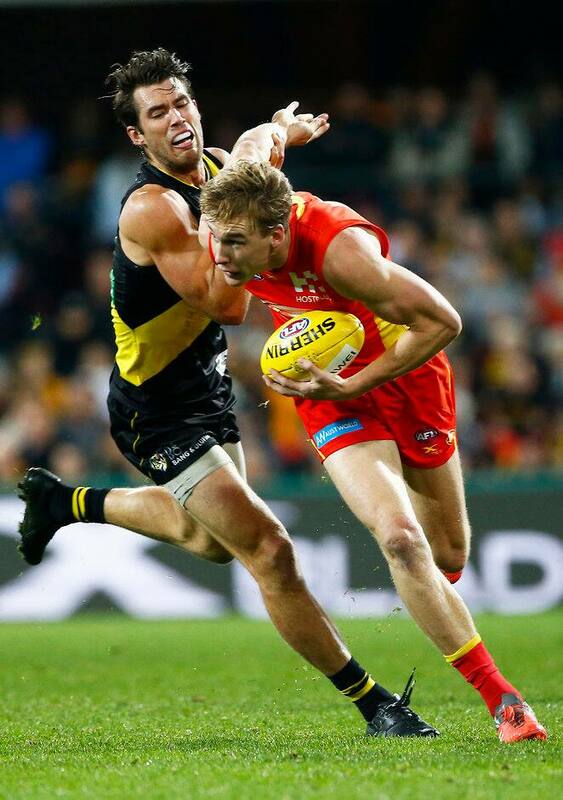 On Monday night, when asked about his club's well-established pursuit of free agent Tom Lynch on Fox Footy's On The Couch, Rance attacked the verbal hard-ball. Most footballers would have hidden behind media department-issued statements, yet Rance was prepared to not only engage in the conversation but actually analyse it. With his still-new status as a Richmond premiership player, Rance provided a perspective that clashed with some at his club who have been working on Project Lynch for more than 18 months. Again, as there is with Rance on the field, there was balance to his words on Monday night. The con matched with the pro, the potential for negative followed by the excitement of the positive. "Team structure would be an interesting one, to throw up," Rance said when assessing Lynch fitting into the Richmond program from 2019. "I wouldn't really know what it would look like, with him in the side, because I'm so happy with what our structure is. "But he's a gun and you obviously want to accumulate as many guns in your artillery as possible. It would be an interesting situation to see what happens, lucky it's not my call." On the $1.2 million-plus a year required to secure Lynch, Rance was also diplomatic. "I'm really proud of the way our list management has been over the last few years," he said. "Dusty (Martin) is the best player in the competition, in my opinion, and deserves the dollars he gets, but I don't necessarily believe that we should be upsetting the apple cart, to go and chase a big fish ... he (Lynch) is the big tuna." In one of the most stunning transformations in VFL/AFL history, Richmond went from crisis at the end of 2016 to premier team in 2017. Overnight, it became a mature club, and was content to enter 2018 without any significant addition to playing personnel. After seven rounds, the Tigers have lost just one game and are top of the ladder with massive percentage. Their still-small forward line is operating just as effectively as the back-half of 2017. But, good clubs know they can't stay dormant with recruiting, and the really good ones have ways of making salary cap room for the best available free agents, particularly match-shaping, 199cm, 99kg ones who have been starved of team success in their eight seasons in the AFL. Lynch, the Gold Coast key forward, is being wooed most by Hawthorn, Richmond and Collingwood. The Hawks are of the view that Jarryd Roughead is now in the same zone as Sam Mitchell, Jordan Lewis and Luke Hodge in previous seasons – very near the end. And Lynch presents perfectly as a replacement. Richmond has Jack Riewoldt contracted to the end of 2019, and its list management department fantasises about having Lynch added to the forward line before Riewoldt retires. Richmond coach Damien Hardwick, who handled himself with pure class when he was under extraordinary pressure at the end of 2016, clearly understands the football and media landscape of 2018. He personally has changed with how he deals publicly with the free agency issue. Three years ago, in late May 2015 to be precise, he was angered by aspects of the AFL free agents system. "Other clubs shouldn't be talking about Eddie Betts, Alex Rance, Patrick Dangerfield, Rory Sloane; it's inappropriate as far as I'm concerned … it's ridiculous we're talking about contracted players," Hardwick said. Two years later, Hardwick had changed, mellowed even, when it came to being questioned about one of his own free agents. "Any club that's not speaking to (Martin) is crazy as far as I'm concerned," he said at a press conference in May last year. In the pre-season this year, Hardwick continued that theme when asked about Lynch. "He's an incredible athlete, great player and a great leader by all accounts … you are actually allowed to do this … we do talk to players who are out of contract," he said. Hardwick, clearly, remains uncomfortable with the free agency system. He doesn't like talking about individuals specifically, but knows the "system" now requires it, and while some people at Richmond were annoyed that Rance was so open with the Lynch conundrum, Hardwick's new outlook would have given it the OK. If Lynch had settled on the Tigers being his new home before Rance spoke, he would be wavering right now. That's not to say that is a bad thing or that he won't become a Tiger at the end of 2018. Rance is right with what he said about Lynch, and had every right to say it. Until very recently, the Tigers would have courted Lynch as a potential saviour, but after they removed decades of mediocrity with last year's premiership, they don't need to approach any free agent in that manner in 2018. This is on the Tigers' terms more than Lynch's.